Evernote3 has only made life easier, simpler, with syncing in the cloud. It’s the goodness of never having to chose between storing stuff on this computer, that computer, on your Flash drive or in the cloud: it’s and, not or. And Evernote does the transparent heavy lifting of all that synced goodness. Evernote can store images (and yes, index and search text in those images…) and PDF files (which, again, it can index and search too). 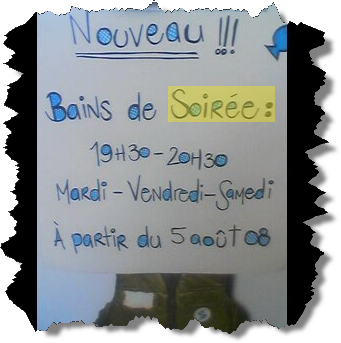 So I didn’t take out my notetaker walllet to copy down the addition to the opening times of the nearby swimming pool; I snapped a photo with the low-res CMOS camera built-in to most cellphones today and emailed it to my Evernote account. Likewise my copy of Leo Babauta’s Zen to Done has been drag-and-dropped into Evernote and is thus available to me anywhere at any time. However, as it goes with these kind of improvements, they make you long for more. That longing rises quickly when you attempt to drag a non-image, non-PDF into Evernote. Having been on the fence whether to continue to use a patchwork of alternative solutions or buy Adobe Acrobat, I interpreted the recently-ish release of Acrobat 9.0 as a sign that I should buy a copy. Ever since I’ve been playing around with the program, liking my new software toy very much — thank you — and turning just about anything into PDF’s. Our Husky now scurries away when he sees me approach. You see where this is going to go, right? Except for the reader-only version, obviously, any edition of Adobe Acrobat 9.0 can create PDF Portfolio’s. Open your copy and go for Create -> Assemble a PDF Portfolio. Grab a file and drag-and-drop it to the PDF Portfolio screen. 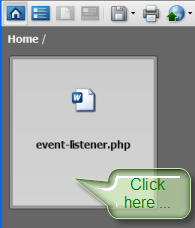 If you want you click on the file name to change that. 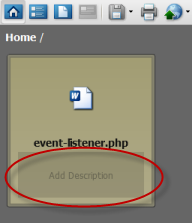 Or click under the file name to add a description to that file. You can switch to the esthetically more pleasing list view too. 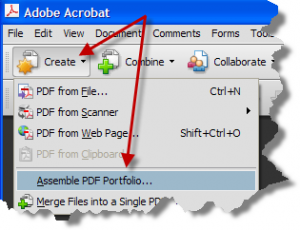 Adobe Acrobat Pro and Pro Extended can also apply templates to how these PDF Portfolio’s look and behave. Brian S. Friedlander’s Assistive Technology has a good entry on creating PDF Portfolio’s in Adobe Acrobat Pro (Extended). The created PDF Portfolio, containing your files, can be dropped into Evernote and will be synced with and through the cloud. Even when (if?) Evernote adds native file sharing, using PDF Portfolio’s in a very elegant way to move and share files which should be kept together. Thanks for that tip; I learned a more basic thing from your post though; that you can DRAG files into Evernote. How did I miss that! Oh I’m happy you’ve picked up on that then, Warrick, because it does make life a whole lot easier. If you select multiple files and drag them into Evernote, Evernote will create one note per file. If you rather have them together, drop one in so a new note with the file is created, then drag & drop your others ones into that same note. Thanks for the PDF Portfolio tip. 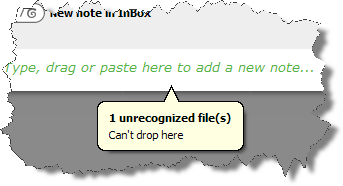 I don’t see why Evernote won’t allow dropping “unrecognized” files in as an attachment. I suppose it’s on their to-do list but your PDF method is a nice workaround. If you drag multiple files onto the *header* of a new note, it will create multiple notes which you can later combine with the ‘Merge’ command. Or just drag multiple files into the *body* of a new note, and all files will be added to just that one note. Obsidian, Evernote will introduce the capability to add any file (see here) for premium accounts. The feature will be updated on the next big release of the clients. 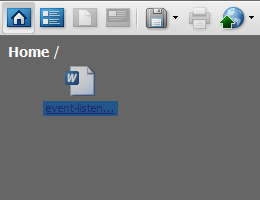 As I write this comments, Evernote have indeed added the file sync feature. But alas, this does not include folders. Can the PDF method hold a folder? You can zip, rar of PDF portfolio a folder and add it that way, yes. Thank you Ruud! I am just about to go traveling and I wanted to access my pdf ebooks and reports on my iPad 2. Now I can easily add them and read up while im on the road. Thanks again!